London's mayor has become embroiled in a new row after criticising two Jewish businessmen involved in building a key facility for the 2012 Olympics. The mayor made the comments during a speech at City Hall. The mayor's office said there was nothing further to add. The mayor is understood to think the consortium behind the project, of which the Reuben brothers hold a 50% stake, is not progressing quickly enough and could be in danger. Conservative members of the London Assembly said the brothers were not Iranian, but had been born in India of Iraqi Jewish parents. Brian Coleman, assembly Member for Barnet and Camden, said: "This is the latest anti-Semitic remark by Livingstone, he clearly has a major problem with the Jewish business community." The brothers released a statement saying the mayor's comments were "totally inaccurate". "The Reuben brothers remain completely committed to the Stratford City project in its entirety as well as the Olympic opportunity," the statement added. "They are working extremely hard to deliver the development for the long-term benefit of London and Londoners. That is what they shall continue to do. "Mr Livingstone's comments on the Reuben brothers' role in the Paddington and White City developments are also unsubstantiated." The row follows the mayor's four-week suspension for comparing Evening Standard journalist Oliver Finegold to a Nazi concentration camp guard. 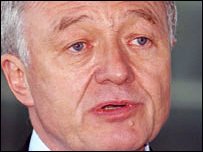 Mr Livingstone, however, won a last-minute attempt to remain London's mayor pending an appeal against the verdict, which was handed down by the Adjudication Panel for England.